FRACTAL S.L.N.E. is a private technological company specialized in astronomical instrumentation and scientific software. 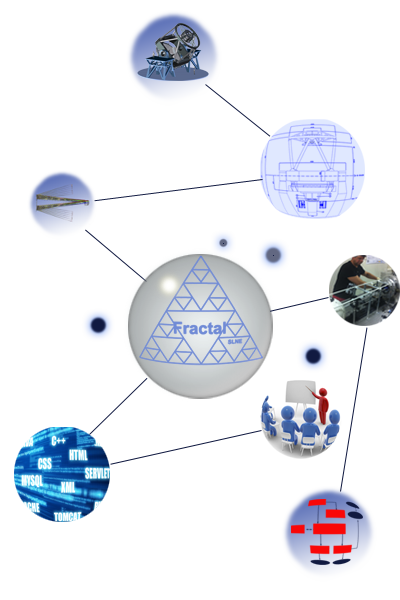 Click here to download presentations and more information about FRACTAL. Check here the last job opportunities. Click here to can receive information of FRACTAL courses, products or services. Click here to go to AstroJobs. We use the know-how accumulated by our team during more than 20 years working at public Research Centers and Universities to develop our customer's projects. We focus our services mainly on the Research Centers and Universities that need to carry out Instrumentation and Software projects, establishing fruitful relationships to fulfill the goals. FRACTAL has an expert, stable and committed team. We cover the subjects of Astronomy, Management, System Engineering, Optics, Opto-mechanics, Mechanics, Electro-mechanics, Cryogenics, Detectors, Data Acquisition Systems, and Software (Real Time Systems, Distributed Systems, Mechanisms Control, Data Base, Telescope's Control Systems and Data Reduction).